A new study offers insights on how states can assist mobile home residents facing eviction, but notes that even helpful policies can have unintended consequences. The issue: Some 18 million people live in mobile homes, a major source of unsubsidized, affordable housing in the United States, according to the U.S. Census Bureau. While a lot of residents own their homes, many don’t own the land under them. About a third of mobile homes are located on leased lots within mobile home parks. And when those parks are sold or otherwise closed, residents can be evicted, oftentimes with little warning. Hundreds or thousands of people can be evicted at once. State laws vary considerably in the number and types of protections they offer residents of mobile homes, which also are called manufactured homes or trailers. One of the greatest dilemmas for these residents is that when forced to leave, they must move their families and personal belongings as well as pay to move their homes, an expensive service. Sometimes, mobile homes are too old or damaged to be moved and, in those cases, residents have no choice but to leave behind what may be their greatest financial asset. No one tracks mobile home park closures or evictions. And there is limited published research on mobile home residents and the public policies that affect them. But a new study of how two key states handle mobile home park closings provides important insights. A study worth reading: “Displaced in Place: Manufactured Housing, Mass Eviction, and the Paradox of State Intervention,” published in the American Sociological Review, 2017. 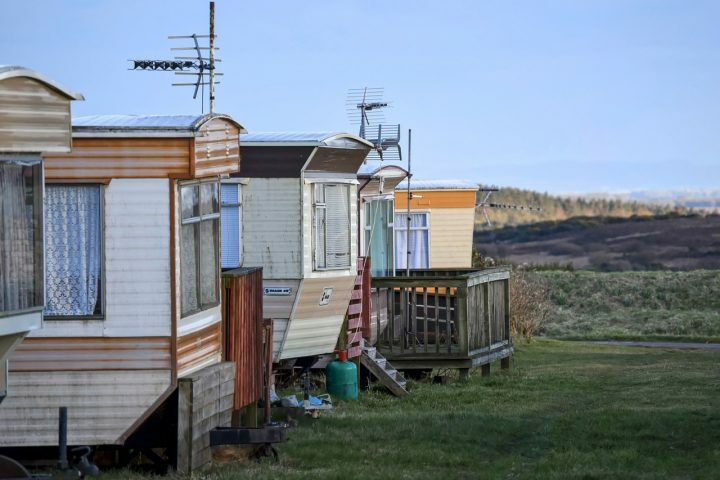 Study summary: Esther Sullivan, a sociology professor at the University of Colorado Denver, conducted an ethnographic study of how mobile home park closures impact residents. She examined how the two states with the greatest number of mobile home residents – Texas and Florida — differ in the protections they offer individuals. Sullivan also compared the states’ responses to the mass eviction of residents from multiple mobile home parks over a two-year period. California has the highest number of mobile home parks (an estimated 4,857) followed by Florida (an estimated 4,207) and Texas (an estimated 4,073). Other states with large numbers of mobile home parks are North Carolina, South Carolina, Arizona, Pennsylvania, New York, Georgia and Kentucky. About 41 percent of all people who live in mobile homes are age 55 and older. Almost one-fifth live in poverty. About 7 percent are not U.S. citizens. Sullivan makes multiple policy recommendations, including establishing a minimum six-month eviction notice for residents and regulating mobile home relocation services. A May 2017 report from the U.S. Census Bureau looks at the average sales prices of manufactured homes by region. The Census Bureau’s “Historical Census of Housing Tables” shows how many people in each state lived in mobile homes at the start of every decade between 1950 and 2000. The U.S. Department of Housing and Urban Development’s Office of Manufactured Housing enforces the standards outlined under the National Manufactured Housing Construction and Safety Standards Act of 1974. This helpful list of Frequently Asked Questions explains what a manufactured home is exactly, how it differs from a modular home and what options are available for financing the purchase of a manufactured home. Duke University economics professor Charles M. Becker and researchers at the University of Vermont’s Vermont Mobile Home Park Research Collaborative also study issues related to mobile homes. A 2016 study in Social Problems, “Housing and Employment Insecurity among the Working Poor,” finds that workers who have been forced out of their homes are more likely to lose their jobs than those who have not. A 2015 study in the journal Housing Policy Debate, “Unreliable Water Access in U.S. Mobile Homes: Evidence From the American Housing Survey,” suggests people living in mobile home parks are more than three times more likely to experience water service interruptions than other households. Citation: Sullivan, Esther. “Displaced in Place: Manufactured Housing, Mass Eviction, and the Paradox of State Intervention,” American Sociological Review, 2017. DOI: 10.1177/0003122416688667.